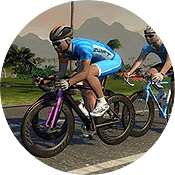 Editor’s note: Jordan Cheyne’s “The Open Pro” series details his experiences with high-level Zwift training as a rider in the pro Continental ranks. You can read his past posts here. 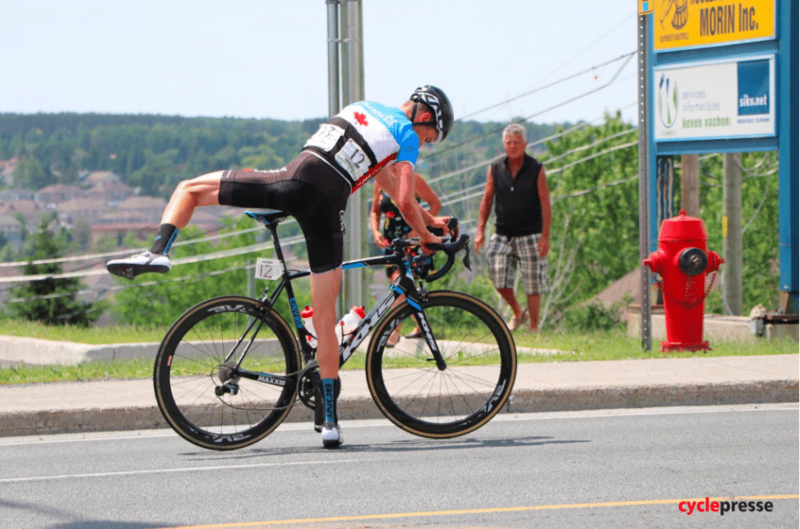 I somehow snuck my way into the Tour de Beauce as a novice in 2012 and was absolutely decimated by the grueling courses and world-class competition. The DNF beside my name after 4 stages should have been written in red ink and bold face type–I was nowhere close. Over the next 5 editions though, I gradually raised my level and the results always showed in Beauce. I managed a couple top 15 stage results in 2014, a podium in the time trial in 2015 and 12th overall and finally a breakthrough 3rd place overall in 2017. I was highly motivated to take another step up this time around as I raced on the Canadian national team for the event. Our national team roster was loaded with talent and experience. Joining me were 3 up and coming U23 talents, multi-time national champion Ben Perry, my climbing-ace teammate James Piccoli, and legendary WorldTour veteran Svein Tuft as a sort of team captain. I had a great showing on stage 1 of the race, bridging to the day’s break with 30km remaining and eventually storming all the way to the 1km to go banner before being absorbed by the peloton. 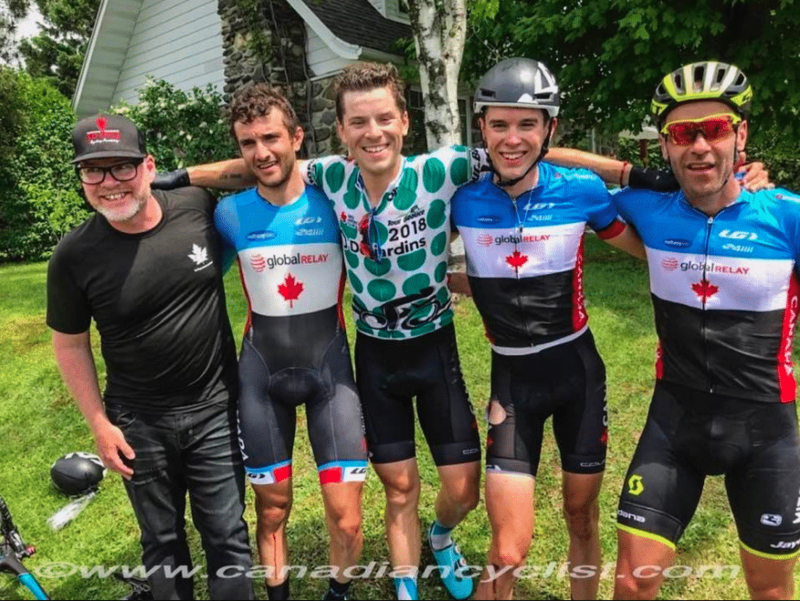 Anything can happen in Beauce and it is always worth rolling the dice if you have the legs. I was feeling as strong as I ever have and ready for a big showdown on Stage 2’s mountaintop finish on Mt. Megantic. Then it was time for Beauce to bring me back to earth. A forecast of periodic showers turned into a 4-hour frigid downpour. I made a critical mistake in getting so hyper-focused on the race to the mountain that I eschewed an extra warm rain jacket and ignored the shivers and hypothermia that gradually worsened through the race. James and I both suffered flat tires and broken wheels riding through the pothole-riddled roads. By the time the climb started I think we were both empty and lost over 2 minutes to the leaders, our GC hopes deflating as quickly as our tubulars had. 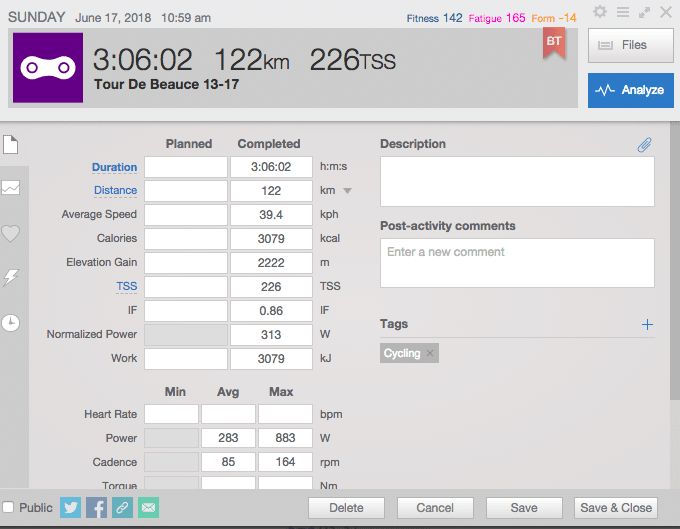 I felt the hangover of Stage 2’s suffering in the next day’s time trial and pedaled to a mediocre time in the top 20. 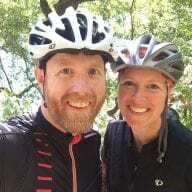 James and I would enter the weekend outside the top 10 overall and a seemingly insurmountable 3 plus minutes behind the yellow jersey that had been within reach just 24 hours before. I fought hard to stay positive and believe in my ability to do something special in the final 2 stages. “Chaos. Breakaway. Win”. That was our team director Kevin Field’s highly condensed team plan for the weekend’s races. We had 4 strong, experienced riders to attack the race and the plan was to use them early and often to try to tip the race in our favor for a stage win and maybe a quiet move up the GC standings. As we tore through Quebec City’s historic streets with 5 laps to go in the 35 lap criterium, we had the first two boxes checked. We had repeatedly attacked the race and ended up with Ben, James and myself in a breakaway of 8 and a healthy gap on the field. It was time to use our numbers to check the third item on the team plan. I attacked as hard as I could through the start/finish with 5 laps to go and didn’t stop until every member of the breakaway clawed their way onto my wheel. James immediately countered and for a moment you could only hear the clicking of freewheels and heavy breathing… no one countered. The gap opened and James was away solo. Ben and I covered last-ditch attacks and watched our teammate ride away. 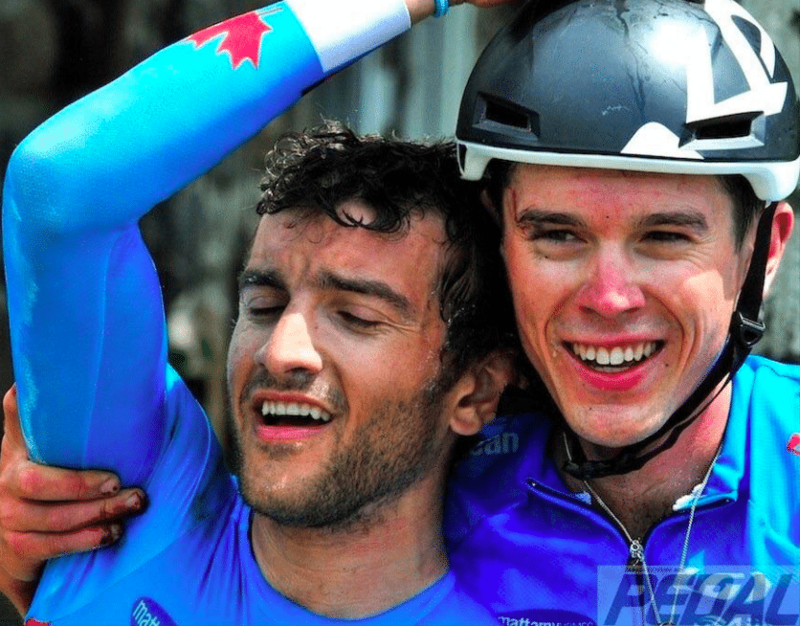 James took a huge win in front of friends and family and shattered the malaise of the previous stages. 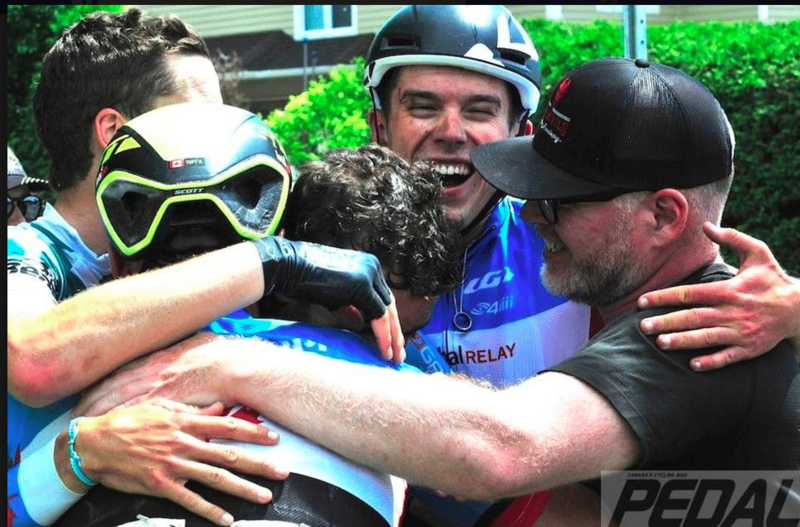 What we didn’t know was that this stage victory was about to become a footnote in the story of the 2018 Tour de Beauce. 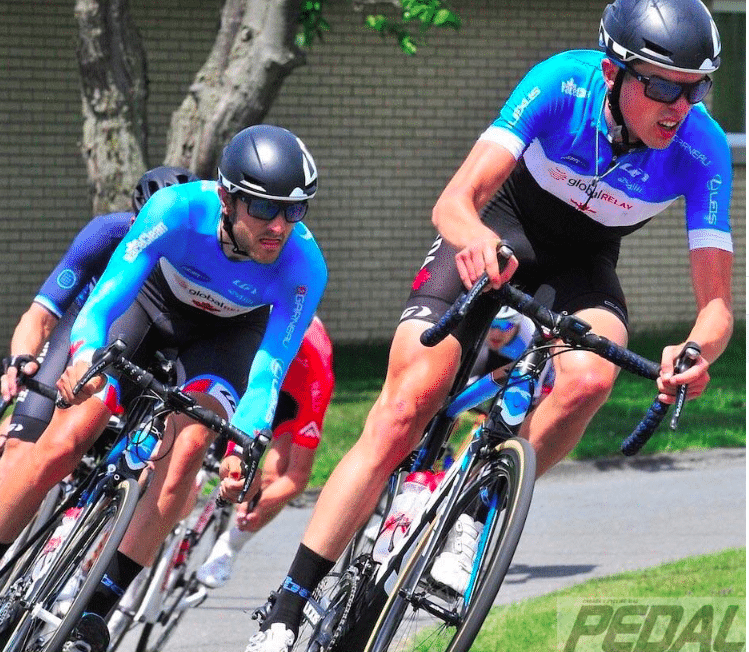 The final stage city circuit of Beauce is one of the most demanding courses in North America. The constant climbing, descending and 18 corners per 10 km lap have determined the winner of the overall in something like 8 of the last 10 editions of the race. I was the final finisher over 10 minutes down when I first finished the St. Georges circuit in 2014. I had the virtual yellow jersey there in 2017 and watched it slip away in the final 2 laps. There were a lot of demons I wanted to vanquish this time around. “Chaos-Breakaway-Win”. This time James and I fulfilled the first two elements almost immediately as we tore away in a group of 8 on the first lap. Thanks to his win in Stage 4, James was now only around 75 seconds off yellow and best placed in the move. He was also the only rider with a teammate and I dutifully started swapping 400w+ turns with him to stretch the gap. That’s the way it was for 100 more kilometers. Our gap waxed and waned, the peloton shattering under collective infighting and our breakaway companions gradually became passengers one by one. For the first time, when I heard a time gap of over 2 minutes with 2 laps to go I left the focus of the moment and began to dream ahead down the road. Moments later I was snapped back to reality and the pavement rushed up to meet me as I overcooked a tricky right-left chicane. I didn’t feel panic or pain, only guilt that I had left James to do the job alone. I got up as quickly as I could and tore off in pursuit, hoping to regain contact and help finish the job. I clamored back just in time to do a couple more full-out pulls and struggle my way home as the breakaway attacked itself. It was true. James in Yellow, King of the Mountains, Team Classification and three in the top 10 overall. I have never been so happy with a bike race. I ended up 9th overall and 5th on the stage but the victory felt as momentous as anything I had ever won myself. The pictures from the finish say it all. We went for it. We finally beat Beauce. We won.